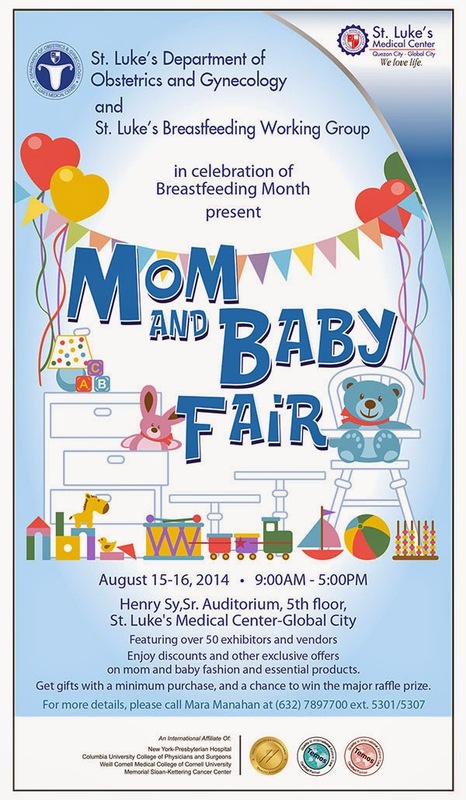 Last August 15 and 16, 2014, St. Luke's Global City held the Mom and Baby Fair at the Henry Sy, Sr. Auditiorium in celebration of Breastfeeding Month. Aside from vendors and exhibitors, the event also featured various talks from different medical practitioners about Prenatal and postnatal care, Anesthesia in pregnancy and Effects in Breastfeeding, Breastfeeding 101 and sponsored talks about Baby Care by Lactacyd and Cord Blood Bank by Cordlife. The event is open to all, with no entrance fee. Participants for the Mom and Me symposium held on August 16 were also given free snacks from de Original Jamaican Patty Shop and free lunch as well. I attended a similar event three years ago during my first pregnancy but I was only able to stay for a couple of hours so I was curious to learn about new things in pregnancy and childcare. I was happy to find out that their program included separate talks for fathers and caregivers, particularly about their roles and participation in breastfeeding. The program started of with a Mother's Yoga Class, followed by a talk from the project head, Dr. Elisa Malvar-Cornelio on the hospital's breastfeeding policy. One of the reasons why we chose St. Luke's Global City is because they encourage rooming-in of newborn babies with their mommies to promote breastfeeding upon the child's delivery. What I especially like about the talks is that they open the floor for participants to ask questions from the doctor speakers. In the talk about Anesthesia in Pregnancy, I was able to ask about the chills I experienced when I was given an Epidural. The speaker anesthesiologist explained that one of the effects of epidural is core hypothermia or altered heat distribution in the body. She assured me that this is pretty normal and that there's nothing that I should be worried about. Since August is Breastfeeding Month, one of the event's highlight was a Kids' Fashion Show which featured the breastfed kids of St. Luke's Global City. Big brands in Baby/ Kids' Essentials and Fashion displayed their products and offered hefty discounts. Of course, I did not pass up the chance to shop for some of the baby items on my list. It was a long, but productive day for all the expectant moms. The event was well attended and I was surprised that a lot of mommies finished the program which lasted until pass 3 PM. Although I was already familiar with most of the things that were discussed, I left the event feeling happy from all the new information I learned. I was also happy to see more merchants/ vendors who gave away a lot of freebies. I think pregnant mommy events like this never gets old. Hmm...I wonder if there would be a third time for me to attend?